Welcome to another August 2014 issue of GL Communications' Newsletter providing information and insight into our enhanced Voice Quality Testing software with Wideband Bluetooth support using the next gen Dual UTA. Latest technologies such as VoLTE and Advanced LTE are expanding rapidly with deployment throughout all markets and all carriers. The VoLTE supports HD voice over AMR-WB networks and requires sophisticated testing for both voice and data quality. Testing must include older generation narrowband networks along with wideband networks when VoLTE to VoLTE calls are established and maintained. Along with voice and data testing, the next generation networks also require delay and call retention testing. GL's mobile test solution provides this capability with the flexibility of connecting to and between any network, any service, and any interface. Typical networks that are supported by GL's VQuad™ - Dual UTA hardware/software include Wireless (VoLTE, LTE, 4G, 3G) via Bluetooth or wired headset, Broadband Internet (LTE, 4G, 3G), VoIP SIP, PSTN, and TDM. Automated testing using GL's VQuad™ includes the following attributes: Scripting with variable parameters, portability for mobile drive testing, remote accessibility from CLI or WebViewer™, centralized data retrieval along with mapping to Google Maps and analysis of Voice and Data. The VQuad™ (Voice VQuad™) software is used for automated call control as well as to automatically send and record voice files from most any type of network (Wireless, VoIP, TDM, & Analog). It supports up to 8 telephony devices simultaneously. A minimum of two telephony nodes are required for transferring files, either within same VQuad™ Node or between multiple geographically separated VQuad™ Nodes. VQuad™ along with the next generation Dual UTA, support for Wideband Bluetooth (as well as Narrowband Bluetooth) allows testing mobile devices supporting VoLTE networks (AMR Wideband). Enhanced VQuad™ now supports user defined GPS information. Without actually connecting to the GPS receiver, the user can configure GPS coordinates within the VQuad™ configuration, thus all results/events associated with the VQuad™ will include GPS coordinates. VQuad™ includes a wide variety of updated test scripts, automatically included during VQuad™ installation. 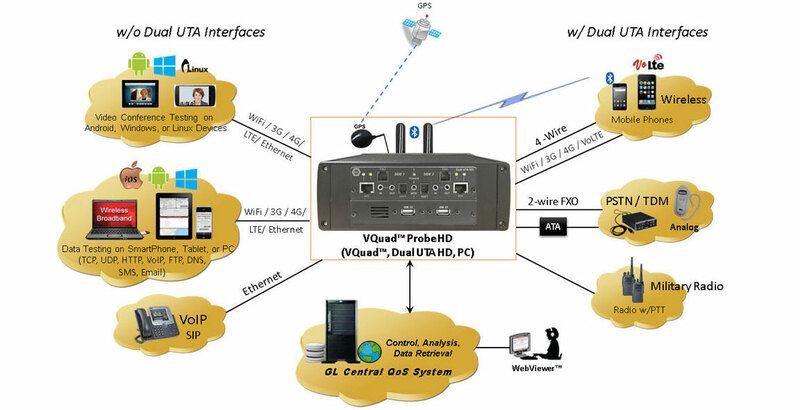 The VQuad™ Probe is a single box solution, which includes VQuad™, Dual UTA and PC. The VQuad™ Probe is portable for drive testing or leaving behind as a network probe, yet powerful enough to be used as a central node of the network (optional rack mountable). 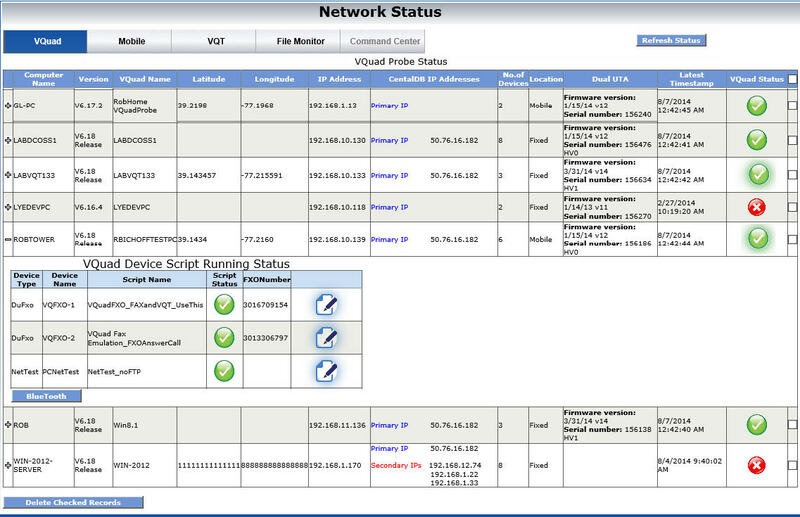 VQuad™ SIP option includes support for all VoIP Codecs. A more comprehensive list of codecs and their details with respective voice quality is provided at this link Codec Listings. GL's WebViewer™ is used to query and filter all results/events/errors from connected VQuad™ Probes. Current status of the entire deployment is displayed along with customized user statistics and results of the active tests. Added to the WebViewer™, the ability to Remote control any connected VQuad™ regardless if the VQuad™ is connected via public or private IP networks. GL's Mobile Device Controller (MDC) provides a liaison to all supported Apple/Android based mobile devices for conducting data NetTests. The Data Tests can be remotely configured and automated from within any VQuad™ node irrespective of the mobile device proximity to the VQuad™ node. Specifically for smart phones, the VQuad™ can fully automate the data tests to any GL app equipped phone irrespective of whether the device is on a voice call or not. The testing is fully automated with results sent to the central database (WebViewer™). Manage the mobile device connections using MDC. Accept, Reject, or Delete any connected Mobile Device. For comprehensive information on the applications, please refer to Complete VQT Solutions web page.